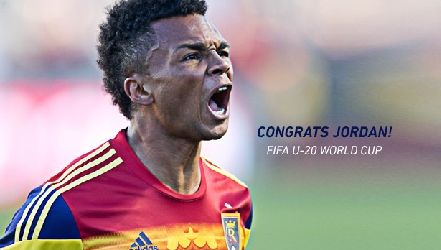 Empire United youth academy product Jordan Allen, currently playing professionally with Real Salt Lake of MLS, has been selected to represent the USA at the Under-20 World Cup in New Zealand. US Soccer's U20 Head Coach Tab Ramos announced the roster on May 7th, just a few hours after Allen started and played the full match against LA Galaxy. NEW YORK (May 7, 2015) – U.S. Under-20 Men’s National Team head coach Tab Ramos has named 20 players to the roster that will represent the USA at the 2015 FIFA U-20 World Cup in New Zealand, which runs from May 30-June 20. Ramos must fill out the final roster of 21 players by May 15, which is the deadline for submission to FIFA. Players will begin reporting May 11 to the National Training Center in Carson, California. The group departs May 16 for training in Australia, where the remaining players will join the camp prior to arrival in New Zealand. The U.S. was drawn into Group A with host New Zealand, Ukraine and Myanmar. The team opens group play against Myanmar at 12 a.m. ET on May 30 in Whangarei, followed by matches with New Zealand on June 2 and Ukraine on June 5, both of which will be played in Auckland. All of the U.S.’s group matches will be broadcast live on FOX Sports 1 and NBC Universo. The U-20 MNT capped off its World Cup Qualifying run at the 2015 CONCACAF U-20 Championship with four-straight wins. After opening the tournament with a 1-1 draw against Guatemala followed by a 1-0 loss to Panama, the team went on to defeat Aruba, Jamaica, and Trinidad & Tobago to earn a playoff match with El Salvador. The U-20s were victorious against El Salvador and the 2-0 win secured the team a spot in the 2015 U-20 FIFA World Cup. The U-20 MNT has played three international friendlies since the 2015 CONCACAF U-20 Championship. On March 29, the team fell 2-1 to England’s U-21s in England. A month later, the team drew 2-2 with Qatar’s U-20s on April 21 during a European training camp that concluded with a 1-0 win over Croatia on April 25 in Austria. Eleven players that were a part of the roster for the Austria camp appear on this roster. The U-20 World Cup showcases some of the world’s best young talent. The USA’s roster at last summer’s 2014 FIFA World Cup featured nine players had previously played in a U-20 World Cup: Jozy Altidore, DaMarcus Beasley, Michael Bradley, Brad Davis, Clint Dempsey, Mix Diskerud, Tim Howard, Nick Rimando and DeAndre Yedlin. The USA’s best finish at the U-20 World Cup came in Saudi Arabia in 1989, where the team finished in fourth place. In 2013, the USA was drawn into a group with Spain, eventual third-place finisher Ghana, and eventual 2013 U-20 World Cup champion France. While the U.S. played France to a draw, it was unable to advance past the group stage. On this roster, eight players come from European clubs, seven players from MLS, two from Liga MX, one from Argentina, one is unattached, and one is playing at the collegiate level in the United States. Eleven players from this roster were on the 2015 CONCACAF U-20 Championship roster. Eleven players from this roster were part of the U-20s most recent camp in Austria. Fifteen players have ties to the Development Academy: Kellyn Acosta (FC Dallas Academy), Jordan Allen (Empire Revolution and Real Salt Lake AZ), Paul Arriola (Arsenal FC), Jeff Caldwell (NC Fusion), Russell Canouse (PA Classics and New York Red Bulls Academy), Marco Delgado (Chivas USA Academy), Ethan Horvath (Real Colorado), Emerson Hyndman (FC Dallas Academy), Bradford Jamieson IV (Chivas USA Academy and LA Galaxy Academy), Matt Miazga (New York Red Bulls Academy), Shaquell Moore (FC Dallas Academy and IMG Academy), Erik Palmer-Brown (Sporting KC Academy), John Requejo (Real So Cal), Zack Steffen (Continental FC DELCO), Tommy Thompson (California Development Academy). Tab Ramos becomes the third coach to lead a U-20 team in multiple World Cups (2013, 2015), following Sigi Schmid (1999, 2005) and Thomas Rongen (2003, 2007, 2009). Kellyn Acosta and Zack Steffen were also on the roster for the U-20 World Cup in 2013, becoming the 8th and 9th player to appear on rosters for two U-20 World Cups/Youth Championships (Adu, Convey, Szetela, Keller, Sturgis, Arguez, Perk). John Requejo and Tommy Thompson are the most experienced players on the roster having both earned 16 career caps with the U-20 MNT. Cameron Carter-Vickers was born on Dec. 31, 1997, making him the youngest player on the roster at 17 years old. Requejo and Carter-Vickers are the only two players that started and played all 90 minutes of all six of the U.S.’s 2015 CONCACAF U-20 Championship matches. Rubio Rubin earned a cap with the U.S. MNT this year during its match against Denmark. Rubin has three career caps with the senior team. Emerson Hyndman is the roster’s leading assist man and has recorded three in six appearances in 2015. Paul Arriola scored the second goal of the U.S.’s 2-0 victory over El Salvador in the CONCACAF playoff match that clinched the team’s spot in the World Cup. Arriola and Requejo are teammates with Liga MX’s Club Tijuana. Shaq Moore was named to the CONCACAF U-20 Championship All-Tournament Team. Acosta and Hyndman played together in the 2009-10 and 2010-11 seasons at FC Dallas Academy.